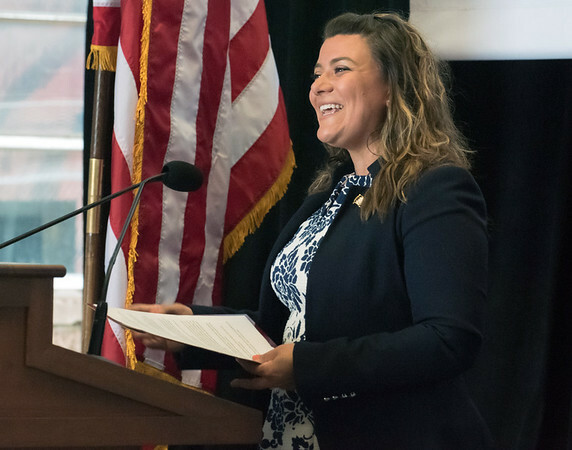 NEW BRITAIN - With just over a week to go to the deadline for filing for additional funding through a state program, Mayor Erin Stewart, who is running for lieutenant governor, has some catching up to do to qualify. According to Stewart’s July 10 financial filing, her campaign had raised $44,355 as of June 30. Republican Party-endorsed candidate Joe Markley has raised $85,557 for his campaign and has already qualified for the program. Stewart’s other primary opponent, Darien First Selectwoman Jayme Stevenson, has raised $69,260 as of June 30. To receive money through the Citizens’ Election Program, candidates must raise $75,000 in increments of $100 or less, mainly from Connecticut residents. The last day to submit an application is July 20. Stewart was a latecomer to the lieutenant governor’s race. She had been campaigning for governor before dropping out and targeting the No. 2 job on the first day of the Republican convention in May. Stewart had raised more than $150,000 for her run for governor, but none of that money could be used for her lieutenant governor campaign. Stewart said she still has a few fundraisers scheduled in hopes of crossing the $75,000 threshold. If she doesn’t qualify for the Citizens’ Election Program, Stewart can ditch the rules of the program and raise up to $2,000 from individuals. Still, Stewart said she doesn’t necessarily think money is the most important part of a successful campaign. The mayor thinks her political record is strong compared to her opponents’. Both Stewart and Stevenson qualified for the Republican primary by receiving more than 15 percent of delegate votes during the convention. Stewart received more than 26 percent of votes and Stevenson received more than 19 percent. Connecticut’s primary election is set for Aug. 14. Posted in New Britain Herald, New Britain, State on Thursday, 12 July 2018 10:52. Updated: Thursday, 12 July 2018 10:55.